Whether you enjoy the magic and suspense of A Chosen War with a swipe of a finger or by gripping pages, there's an option for you. Love sharing a good page turner with friends? Add this book to your Goodreads list. Nineteen-year-old Maia has spent her life haunted by dreams of a man with uniquely brilliant blue eyes. She never expected she’d actually come face-to-face with him, or that he’d be the harbinger of a chaotic new life. But as shocking as meeting Blake is, it’s less unsettling than her sudden ability to adversely affect electronics and seemingly control—even heal—plants. Before she can figure out what’s happening, Blake’s cryptic warning about the impending approach of something big manifests as a freak earthquake, destroying Maia’s home and killing her parents. Devastated, Maia has no choice but to turn to Blake, where she learns that the earthquake was not as natural as it seemed. The reigning Terra guardian, or Mother Earth, has gone rogue, wiping out her replacements in a series of orchestrated natural disasters around the world—and Maia is next. Worse, she’s the only one who can stop the Terra guardian from destroying not just Earth, but the fabric of the universe itself. Now, thrust into a world of celestial beings charged with the protection of the universe, Maia must come to terms with her new powers and the idea that her destiny was shaped long ago. And she must do it all before she faces off with the woman who controls nature itself. Intelligent and thought-provoking, A Chosen War takes the idea that everything is connected and wraps it in a globe-spanning adventure with just a tinge of romance. Have you added A Chosen War to your Good Reads TBR pile, yet? Stars, why not? Ashley Ruggirello of Cardboard Monet created this enchanting cover. Isn't it magical? I can't wait to see this beauty on the bookstore and library shelf! 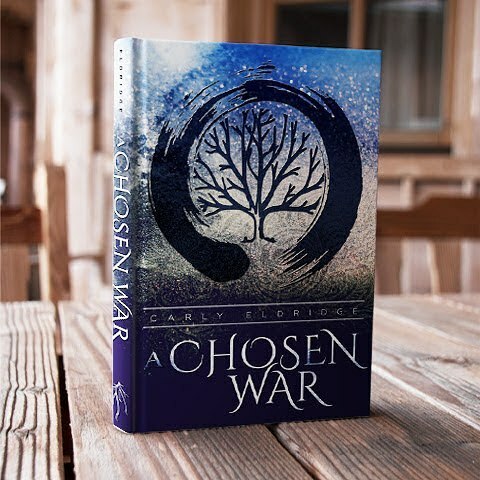 A Chosen War will be released on April 25th! Be sure to bug your local bookstore and library to carry it and spread some indie book love. The official press release can be seen here. But what is it about, you wanna know? Well, the idea first germinated from the story of the fall of Lucifer in the Bible. However, I didn't want this book to be religious or feature angels and demons because lesbi-honest, that's been done. Lucifer was called Morning Star and Son of the Dawn when he was still an angel and that got my wheels turning. What if when God created the Earth he created Guardians to govern the Earth and her various elements, as a way of ensuring everything runs properly? There are also many myths about a Mother Earth from various cultures as well as gods used to explain the natural functions of our universe. What if Lucifer was placed as the sun's guardian and there were guardians and keepers for the moon, earth, water, animals, plants and weather? What if, when he went after God's throne and was cast out, he was replaced, who would that person be and how would that system work? These many "what if" questions finally led me to the story of A Chosen War where 19-year-old Maia finds out she's one of those replacements. The idea of taking over God's position as ruler of the Universe is still appealing to these powerful guardians, and the current Terra Guardian (Mother Earth) has decided she as good of a chance as any to actually succeed. When the current Sideralis (sun guardian) and Corocottas (animal guardian) approach Maia for help she is thrown into an ongoing battle for not just the Terra Throne, but also the position of Praevalidus (god of the Universe) with the other chosen guardians. It's going to be up to her to decide if she wants to become the next Terra Guardian and if she's willing to go against the current Mother Earth to do so. Her first test will be to realize that there is such a thing as being too independent, and her second will be choosing a piece of her humanity to sacrifice to obtain the power she needs to fight. To find out what she decides, I hope you'll pick up the book when it comes out!